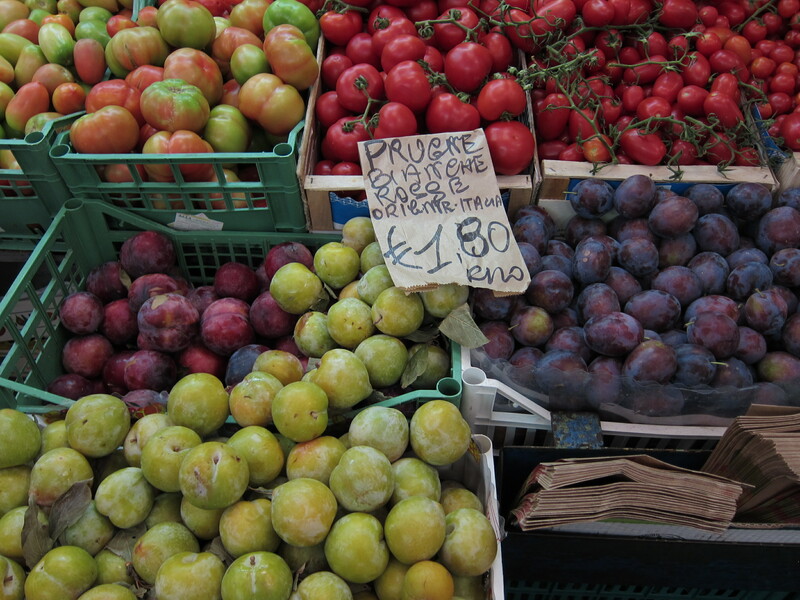 But there is one very good reason to be in Italy in August: summer markets. We were staying in an apartment right by Campo de Fiori and its market, which was described as touristy but to me seemed just sort of puny. There were many more people hawking T-shirts and dried pasta than actual fruits and vegetables. I did like watching vendors use the fountain as a giant public sink. 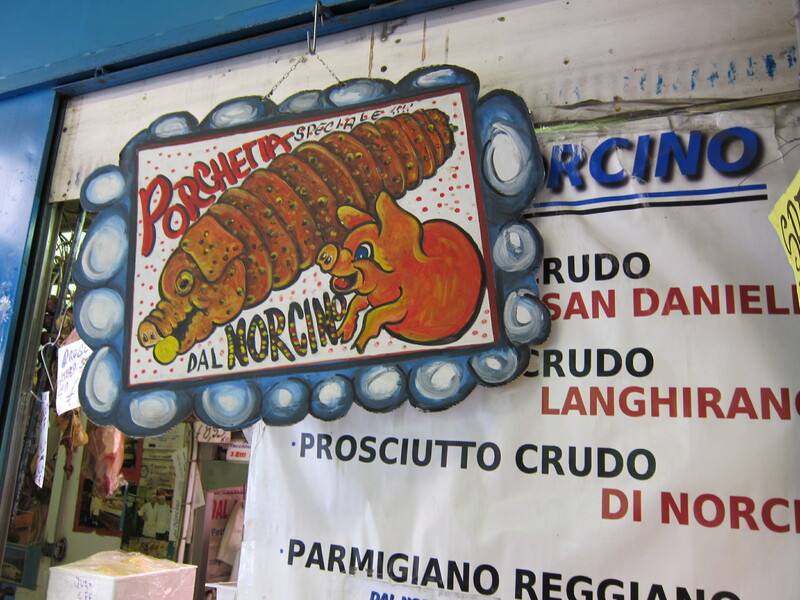 The market that felt much more workaday was the large covered market in Testaccio. 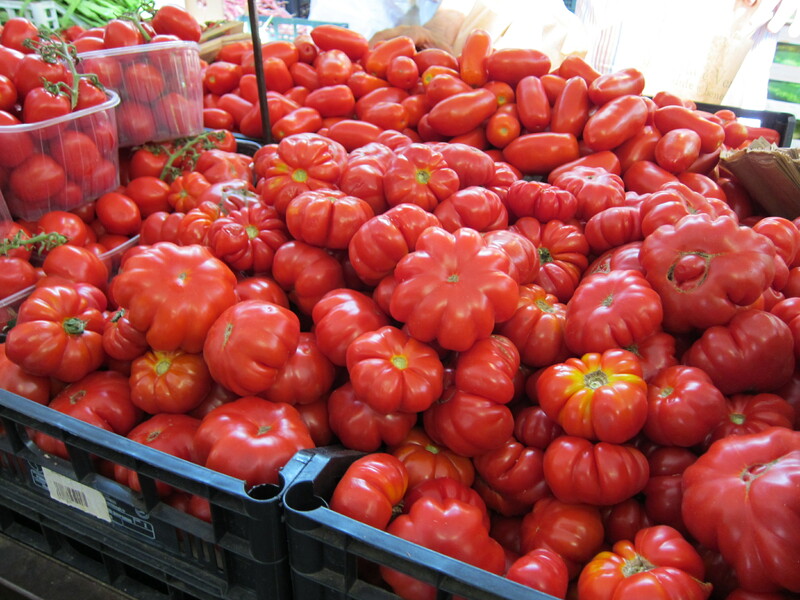 These tomatoes, so uniformly red, were not very sweet, but they had a lot of tart flavor. If we’d had more time, I might have cooked them down into a sauce. With all the pizza and pasta we were eating, I was eating mainly fruit for breakfast and snacks. I love plums that are a little hard, that you really have to bite into, but that yield very sweet, just faintly tart flesh. 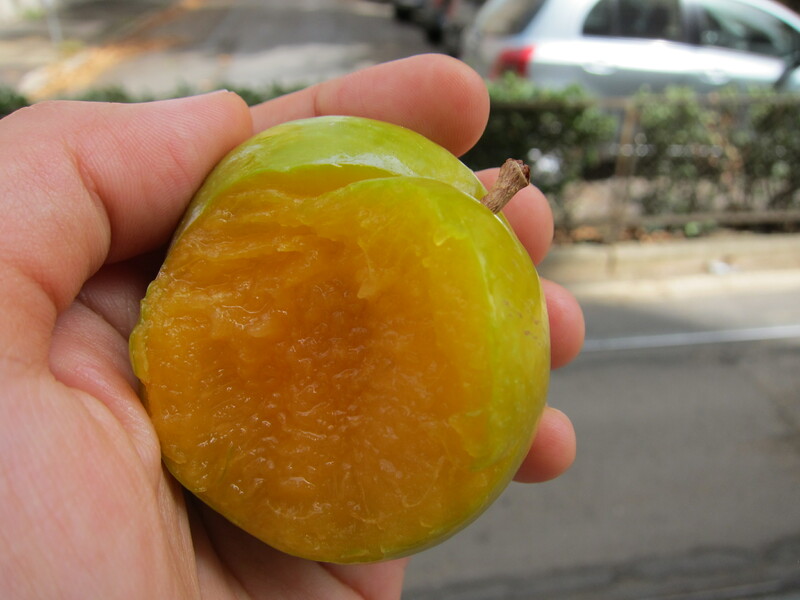 Italy has many different kinds of plums just like this, all with varying perfumes. 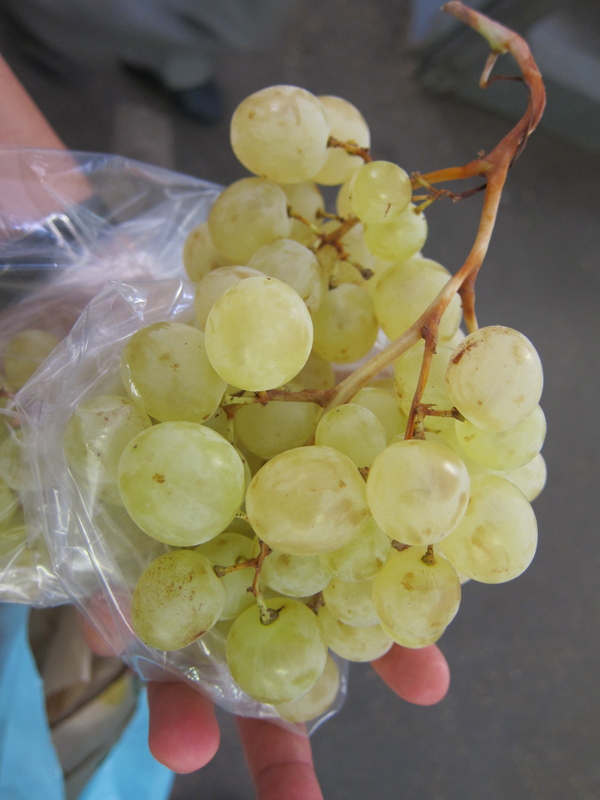 I gravitated toward these dusky grapes that looked nothing like the grapes I find at home. They tasted as you would imagine they would, sort of lightly floral and fleeting. When you buy fruit in a market, you can wash and eat it right away because there are those ubiquitous fountains spewing forth clean, fresh water. 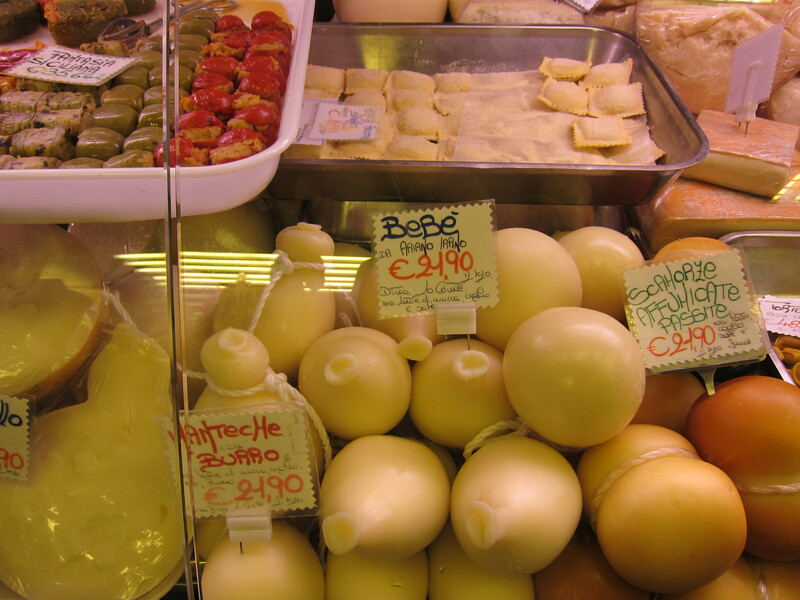 Testaccio market also had butchers, salumi and cheese shops, pasta shops, all the little things you might need. 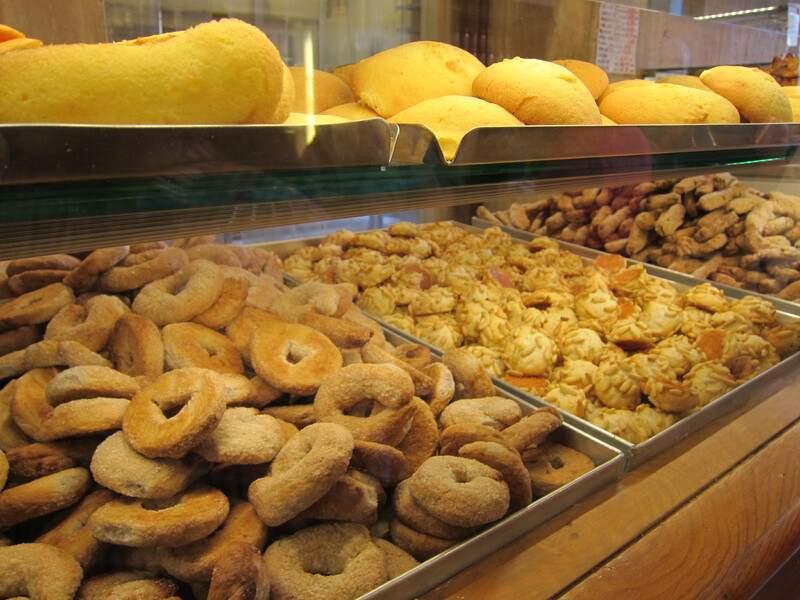 It reminded me a bit of the markets I loved in Mexico. The man at this salumi/cheese shop was very eager for us to taste his cheese. 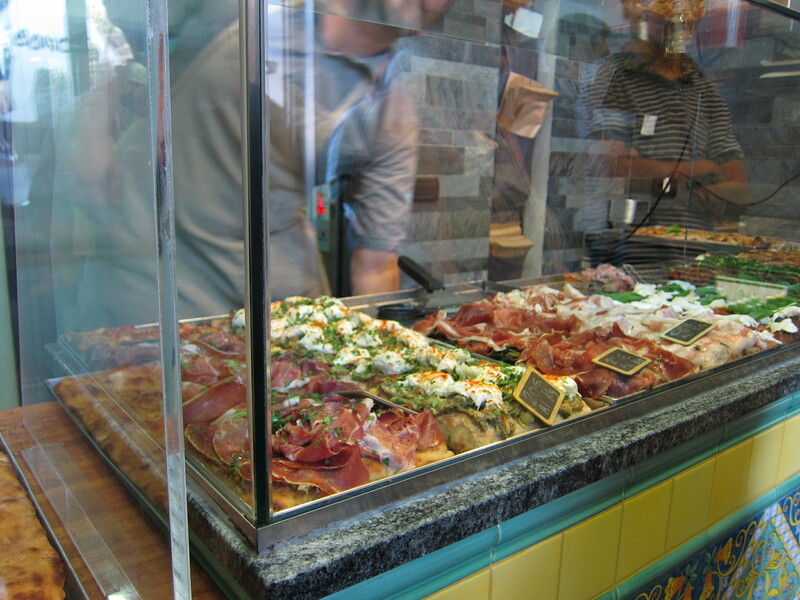 He sold us way more fresh mozzarella and salami than we had asked for, with a corresponding surprise in price, but the mozzarella knots (which he urged us not to refrigerate) were so good, we forgave him. 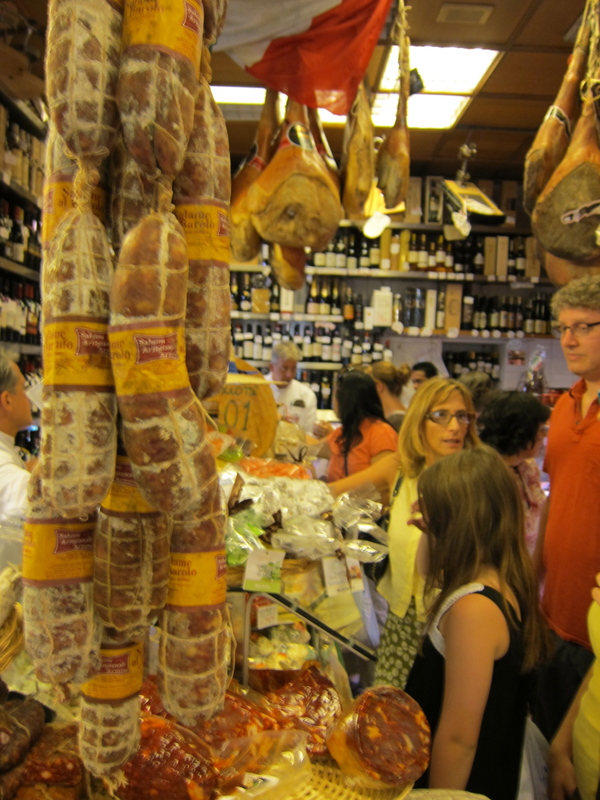 Just a few blocks away is the famous food store Volpetti. It’s not very large, but every conceivable space is filled with something you would like to take home. It’s worse than a pet store with puppies in the window. I had been warned that it was very easy to rack up an enormous credit card bill, so I limited myself to two smallish chunks of cheese, a pecorino with pistachios and a similarly hard cheese studded with truffle bits, and some wild boar salami. I may or may not have finished eating everything before I went through customs. The guy who helped me clearly saw “starry-eyed tourist” written all over my forehead. I think he was disappointed I didn’t buy more. He clearly didn’t see “nonprofit worker” also tattooed on my forehead. 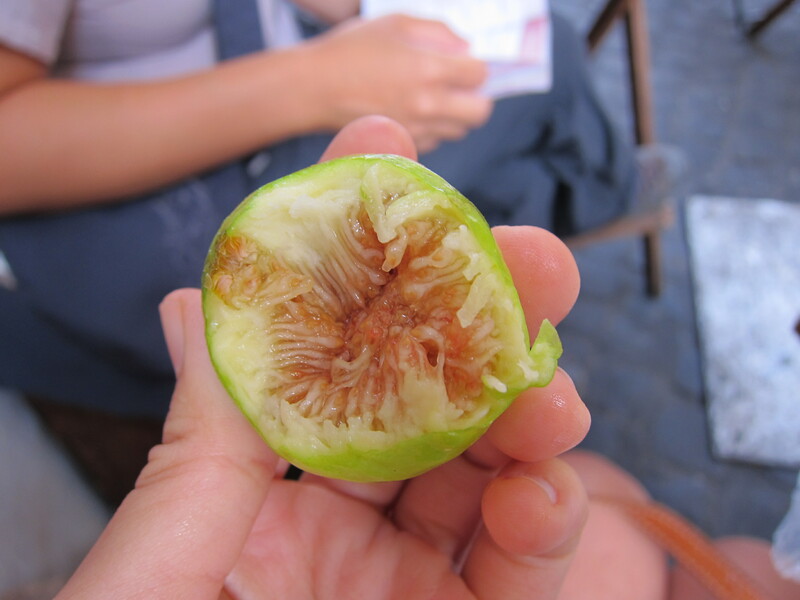 Even though my purchase at Volpetti was my second-biggest in Rome, I was actually pleasantly surprised by the prices there and at the market in Testaccio, even with the exchange rate. The cheeses were around 30 euros/kilo, or about 15 euros/pound. The fruit at the market was so cheap, I felt almost like a thief. (I have since heard the European Union subsidizes organic food.) In New York, most cheeses at fancy shops seem inevitably to hover around the $25/pound mark, and I don’t even want to think about how much my local farmers market charges for Italian prune plums (which really do not taste so sweet outside of Italy). I am not a pizza connoisseur. I don’t really know what makes a pizza Neapolitan, or even New York-style at this point, given how saturated New York has gotten with fancy pizza. But I do love it, and even though I ate pizza probably over six times in five days, I didn’t even come close to getting sick of it. 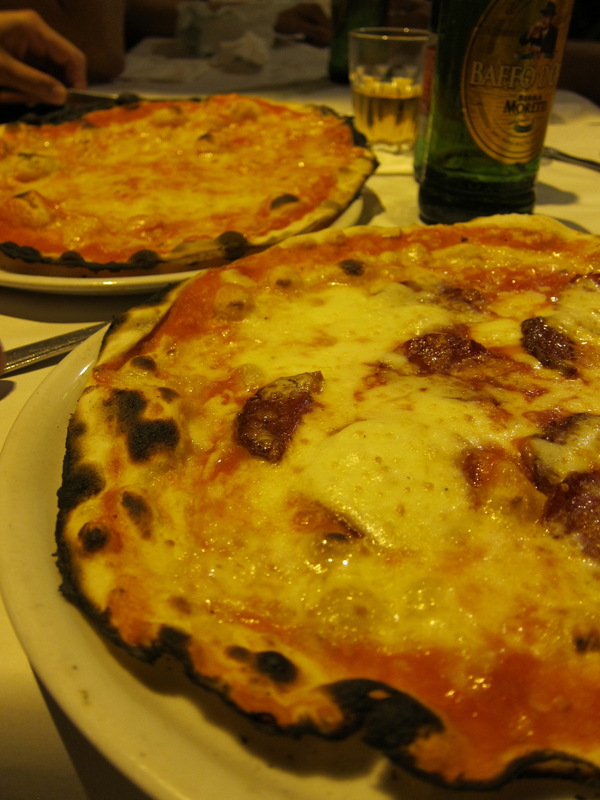 It helped that pizza has a multitude of meanings in Rome; all incarnations are delicious. 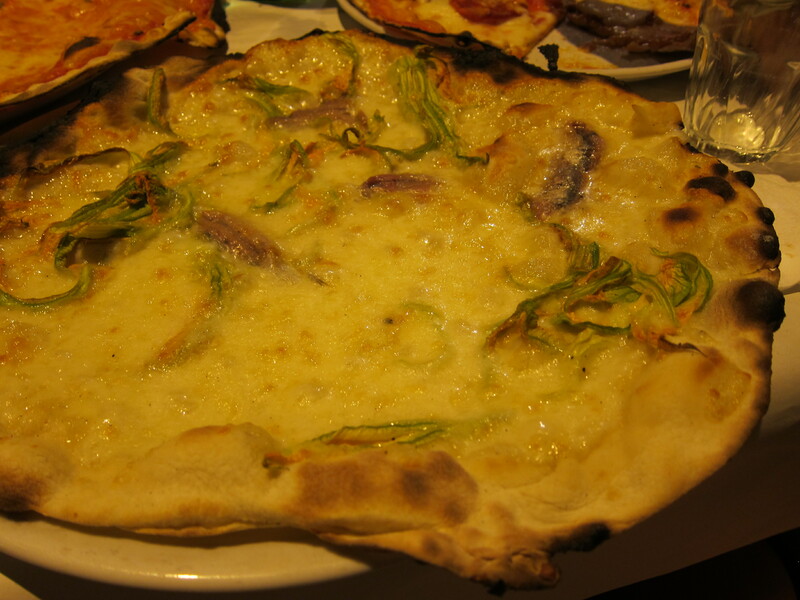 There is the famous “pizza bianca,” which looks like a rather plain and dry piece of focaccia. 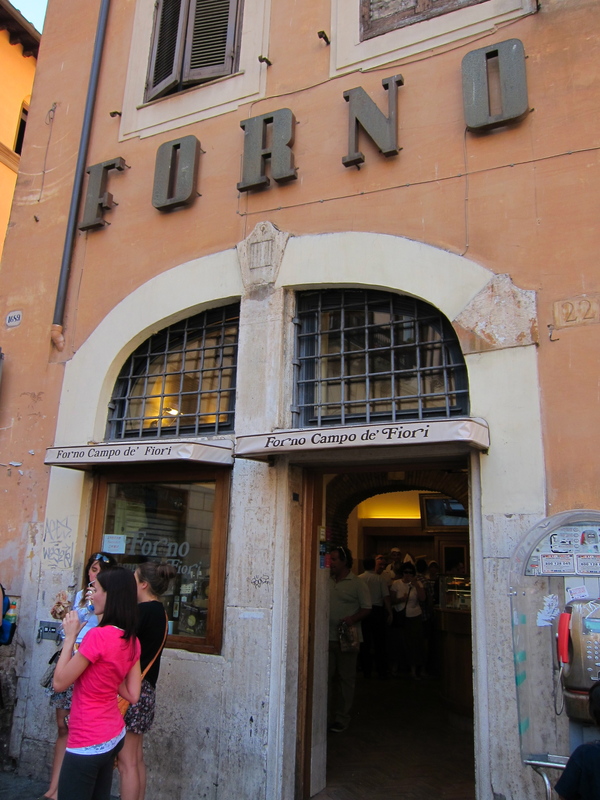 It was one of the first things I ate in Rome, at Forno Campo de Fiori, which is consistently named as one of the best places for pizza bianca in Rome. Later in the trip, I had some pizza bianca from Roscioli that was a little too old and almost too much work to chew, but that first piece I had at the Forno was still warm from the oven. People often put a little prosciutto in between two pieces to make a sandwich, but when it’s fresh, it’s amazing how delicious plain food can be. We had a piece of pizza with mushrooms and that was tasty, too, as were the cookies I bought for my sister my last morning in Rome. And then there is pizza al taglio, or pizza by the slice, which in Rome means by weight or, if you speak Italian as poorly as I do, by a wave of your hand and a grunt or two. Pizzarium is famous for their luxurious toppings, but it’s as casual as most pizza al taglio places, a gorgeous counter with an array of pizzas and then just a couple of places to stand with big stacks of napkins. 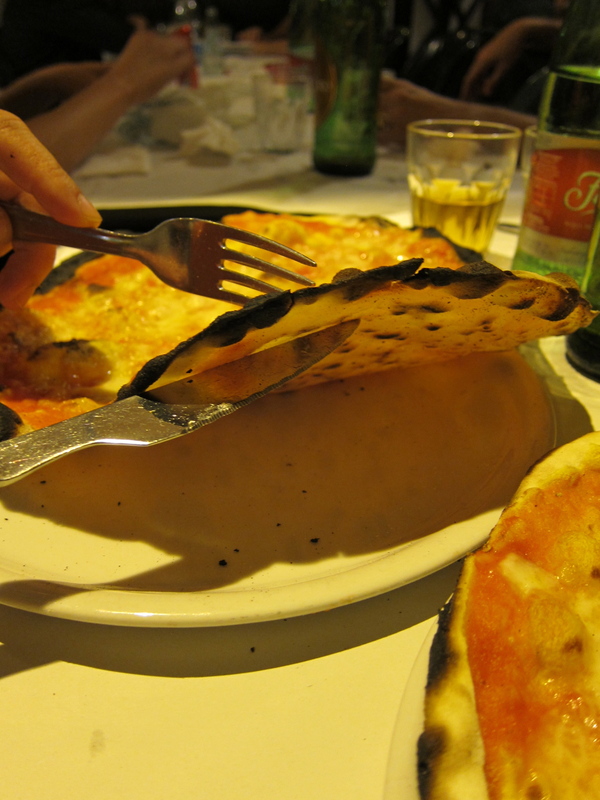 You’ll often see people eating pizza with a fork and knife, but not pizza al taglio. 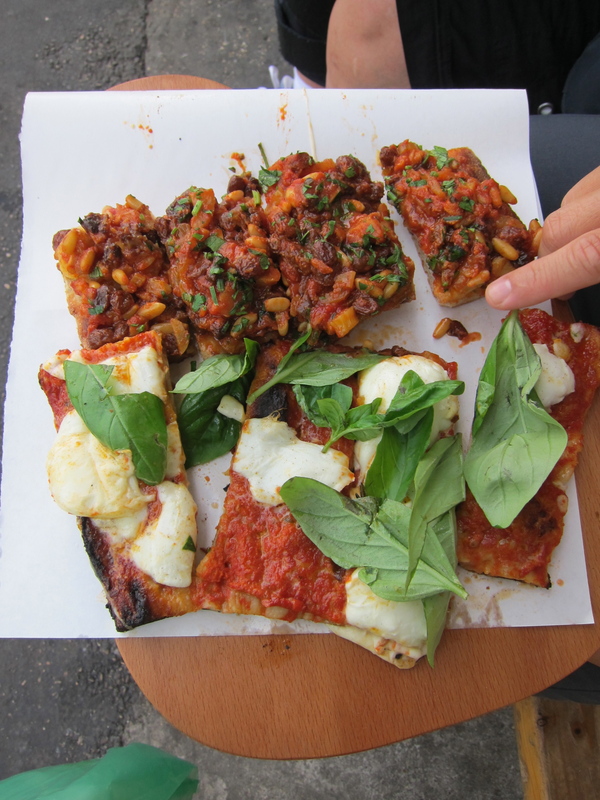 Zizou found the caponata topping too sweet, but I love sticky-sweet eggplant and pinenuts. The bread was a little doughier than I would have liked, but I would happily have stuck around for a few days to try some more toppings. There was one that was snowy with layers of lardo — I regret a little not trying it. 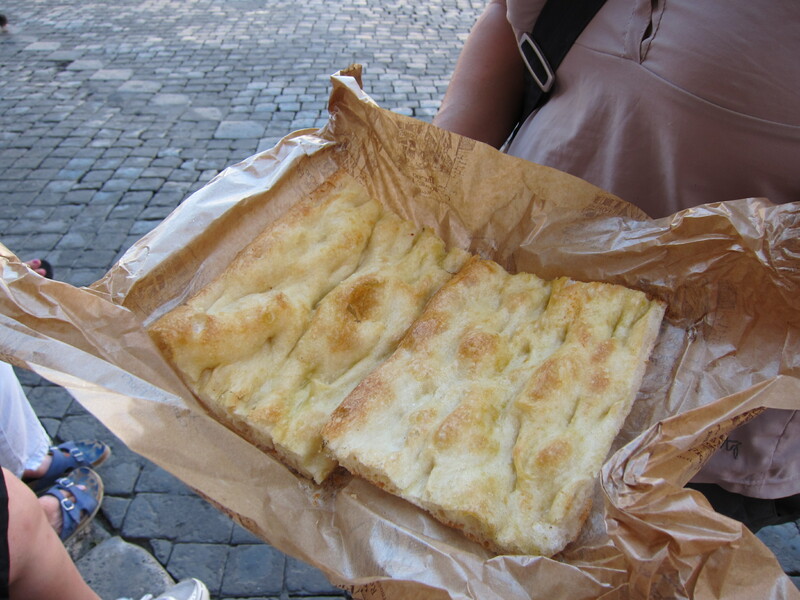 My favorite Roman pizza, though, was the Roman or Lazio-style pizza, which features a thin and crisp dough, almost like a cracker. It can fool you into thinking you haven’t really eaten that much. 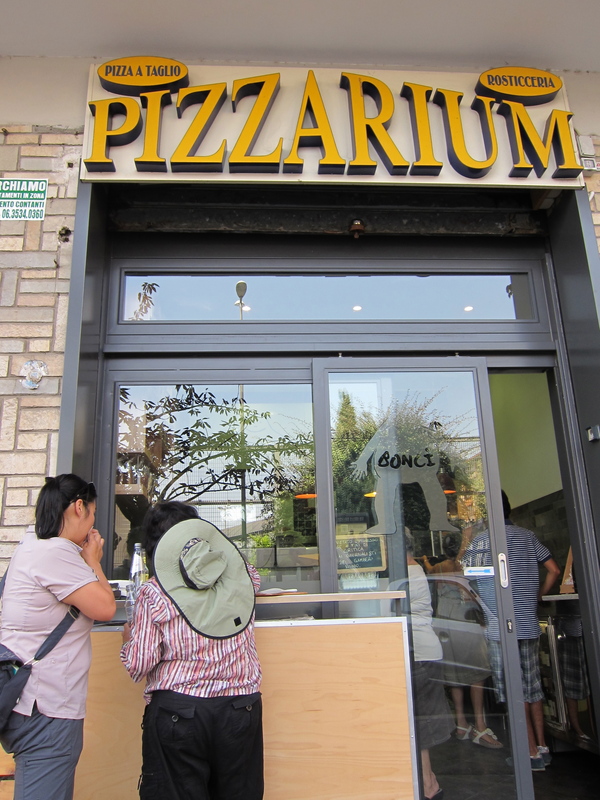 We did often see Roman families sitting around, one pizza in front of each person, so maybe they feel the same way. 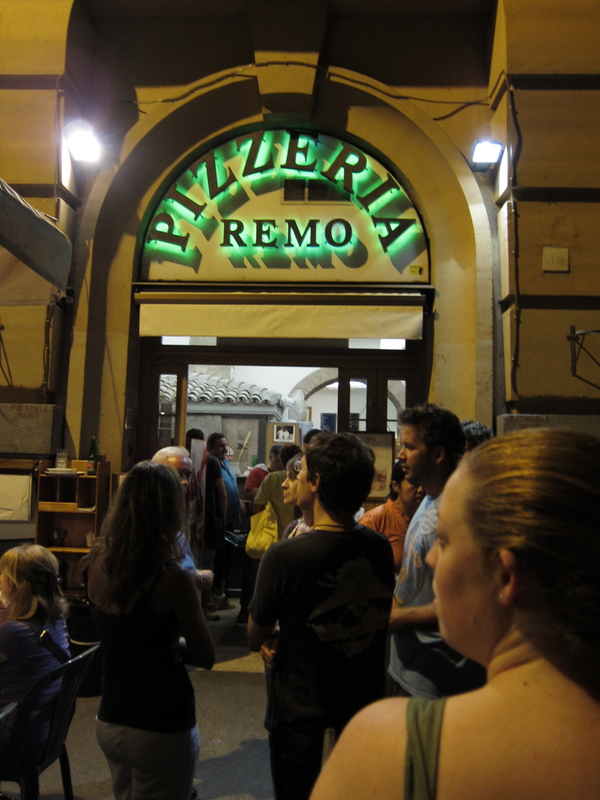 The pizza we had at Dal Paino in the Centro Storico was tasty and certainly convenient, but the pizza we had at Pizzeria da Remo in Testaccio may have been my favorite meal of the trip. I know a huge part of it was just the atmosphere. It was a Saturday night and the sidewalk was packed with clusters of friends and families. It’s been discussed on Chowhound, but for one reason or another, there wasn’t a visible tourist presence. 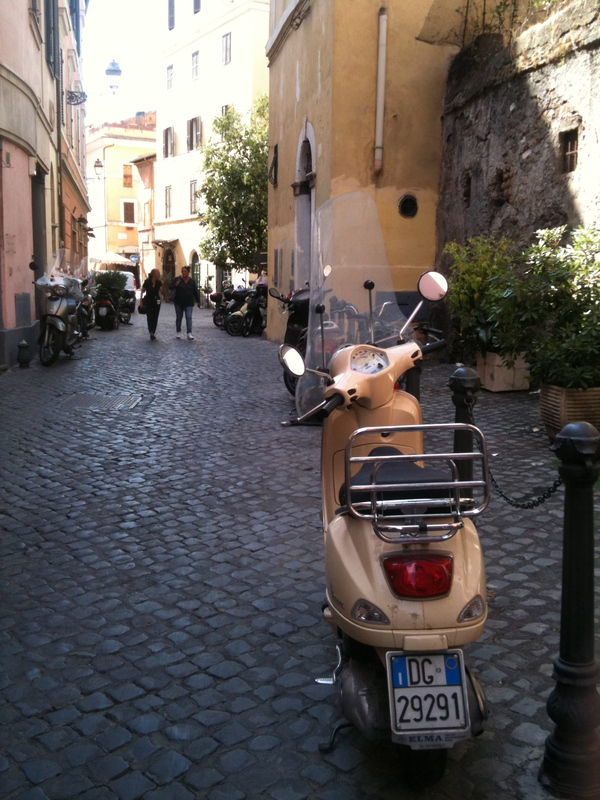 It was one of the rare moments in Rome where we felt absorbed into regular Roman life. The crowd was pretty boisterous — kids running around, people talking and laughing — but not at all impatient. The big-bellied owner pacing up and down past the sidewalk tables, almost willing people lingering over their pizzas to leave, so at least we knew the restaurant was trying to seat us. We didn’t have time to go to a fried fish restaurant, so I insisted we try some of their fried baccala which was hot and wonderful. But look at the pizza! We got a plain margherita, another with sausage, and then a third with zucchini blossoms and anchovies. Look how thin the crust is! I thought it was really the perfect complement to the cheesy, salty toppings. It may be blasphemous to say this, but as a kid, I really liked the Pizza Hut Thin Crust pizzas, and these pizzas reminded me why. We were too full to try any “ice cream to the coconut” or “coffee chocolate italian soft cheese,” but it always gratifies me when I realize non-Korean people also have serious trouble with English translations. Pizza and beer on a Saturday night — so familiar and yet so new. For a city of such obvious, monumental accomplishments, Rome felt a little poorer than I expected, even a little backward. 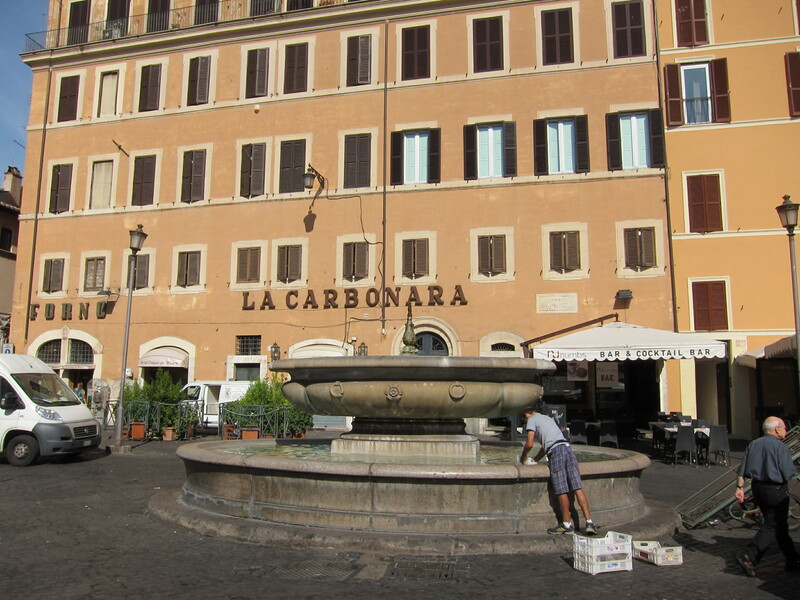 But the city is overflowing with riches in two important areas: gelato and fountains. Gelato, of course, is on almost every other corner. Most of it looks terrible, cheap, and artificial. 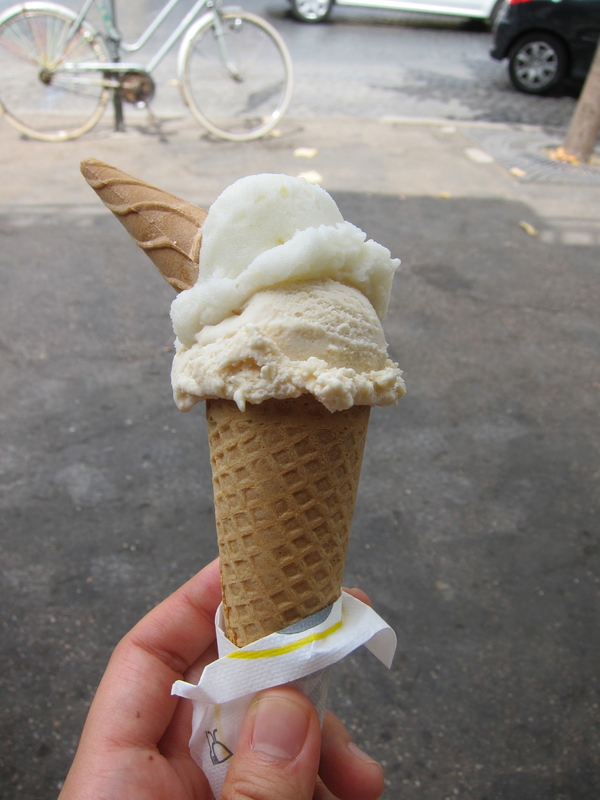 My first cone was too sticky-sweet and shallow in flavor, and to top it off, the surly woman at the register tried to charge me for a gelato my friend had already paid for. 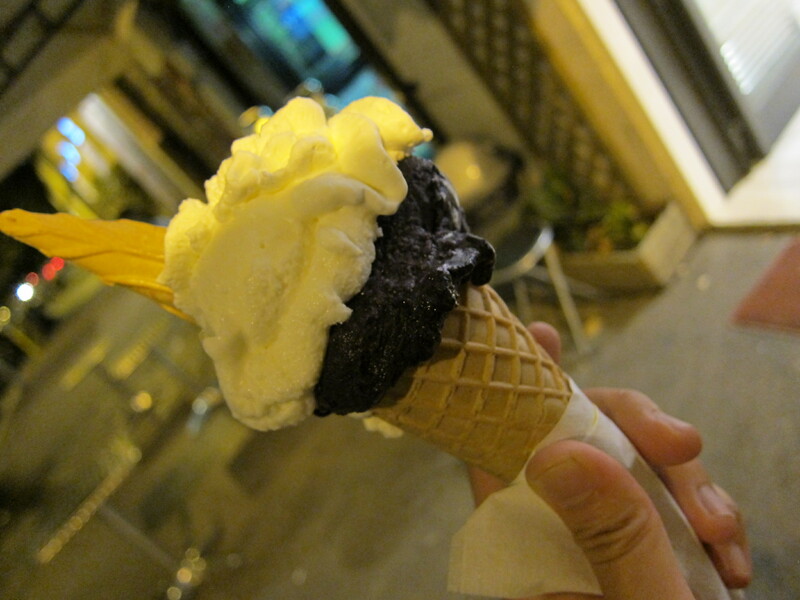 But good gelato abounds as well. As we walked into Gelateria dei Graachi, we saw Italian men in their well-cut suits walking out, happily eating ice cream cones. 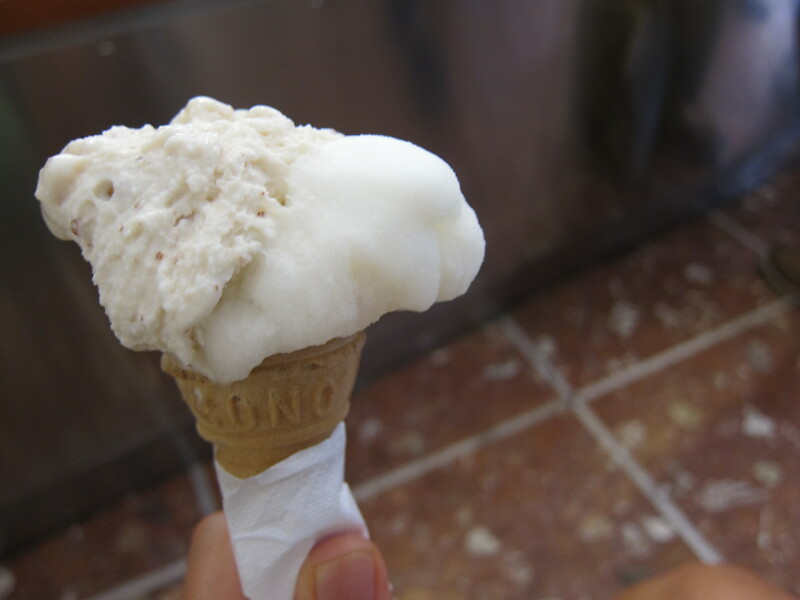 The gelato there is good, still a tad too sweet, but the flavors are pure and clean. 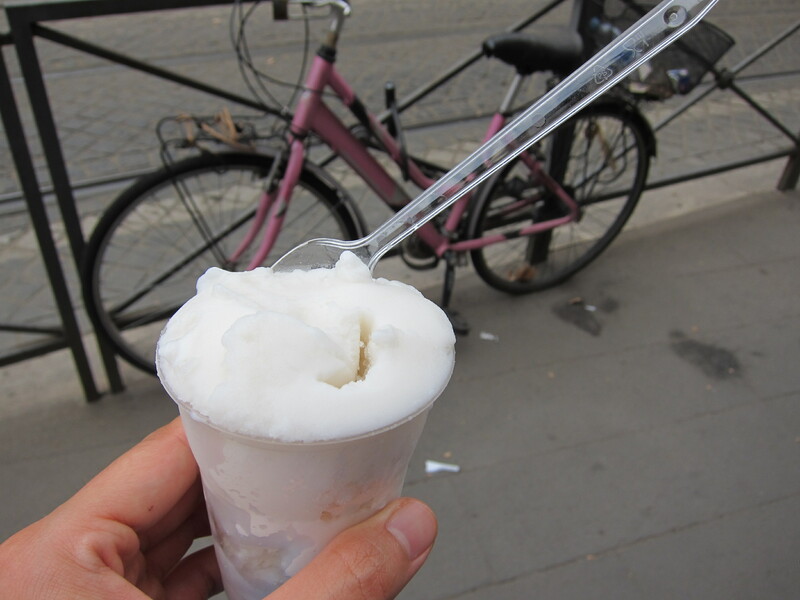 I love that almond is such a typical flavor in Rome — why isn’t that true in New York? 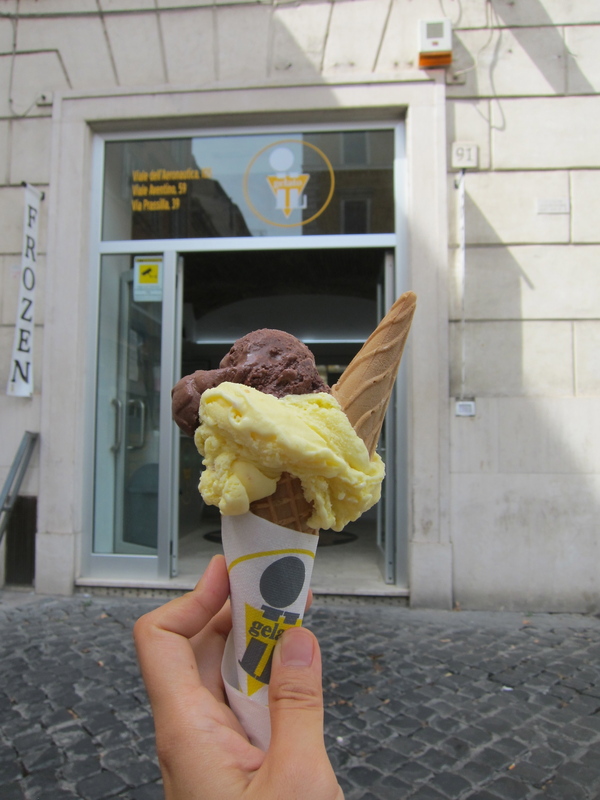 But my favorite gelato, the gelato I liked so much I ate it three times in five days, including twice for lunch, was at Il Gelato di Claudio Torce. (You can find a nice interview with the man himself at Katie Parla’s blog). 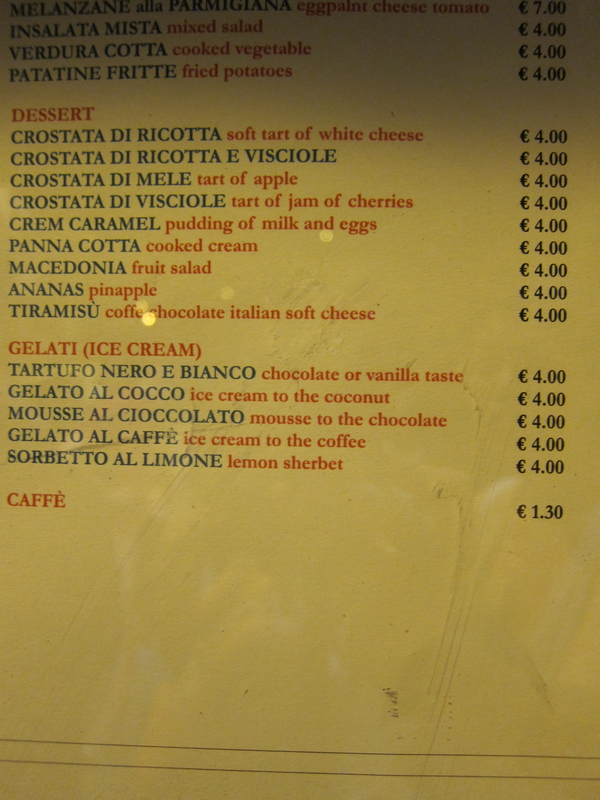 I tasted mora (blackberry), a sesame-almond, lemon-almond, fior di panna, crema di limoncello, and one of at least 10 different chocolate flavors at the outpost in the Spanish Steps. When asked if you want your gelato “con panna,” you should say, “Si!” The whipped cream is held in place with a jaunty little bonus cone. 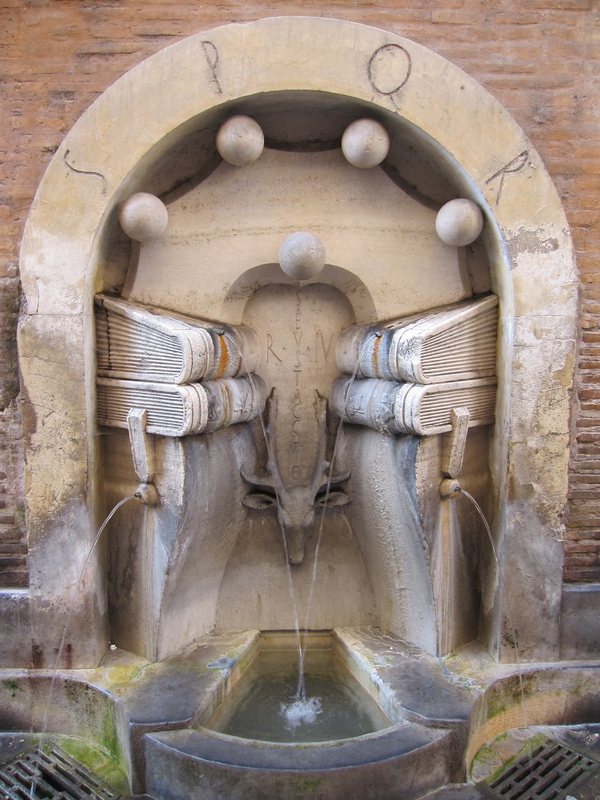 And when you are feeling sticky and thirsty from all that gelato, the fountains of Rome are not only good for photos and wishes — they are overflowing with potable water. Really. 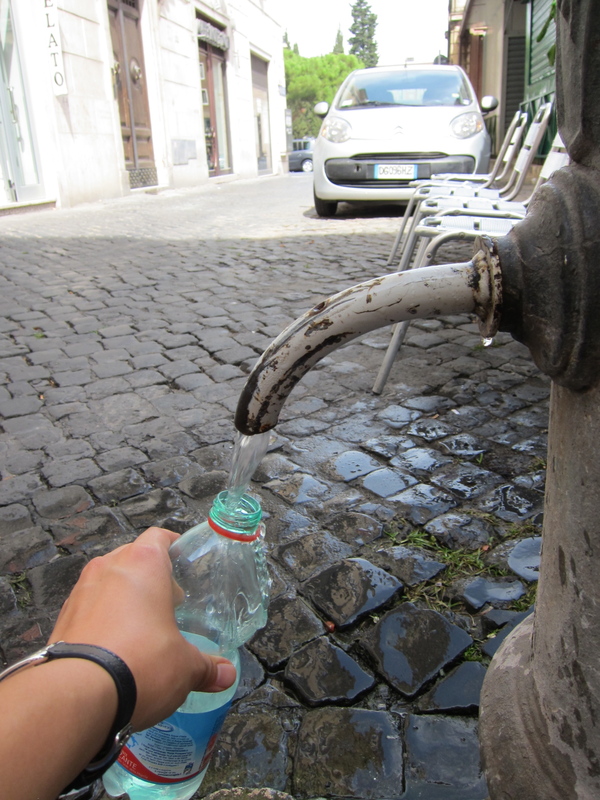 This is the quintessential image of Rome, right? What I really wish I had managed to capture on camera is the pay phone that whimsically went in and out and then back in service, all within five minutes, for no reason whatsoever. One of the things I love most about traveling is that it challenges your assumptions. 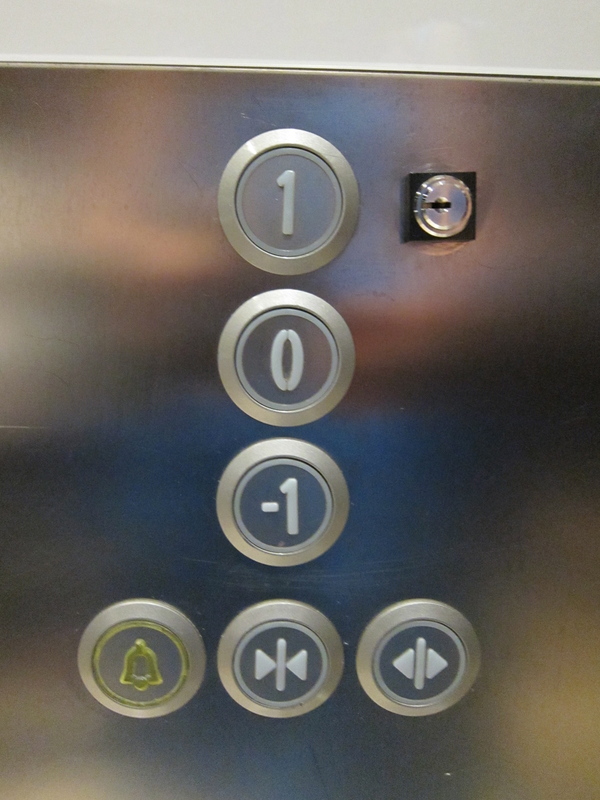 Why should the first floor be “1”? When a rental agency says there is a lift to the apartment, what would make you assume the elevator starts at street level? When you need to talk to the ticket agent at the train station, why should you be surprised to stand on an hour-long line? Really, why? The beauty of Rome is that once you get over your befuddlement, it gives you great pasta. 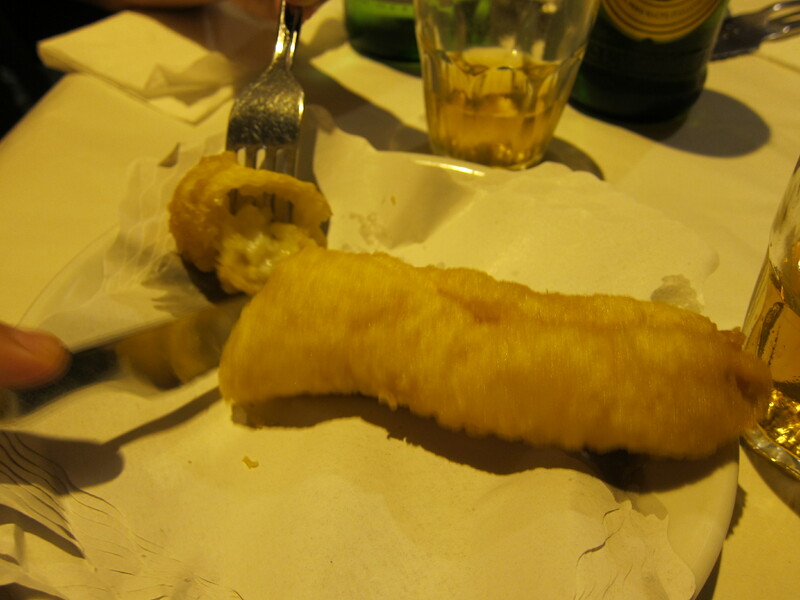 The food, honestly, was not the most wonderful, amazing Italian food I’ve ever had. But it was very, very good. More importantly, it was good without much effort or fanfare, reminding this New Yorker with a warped view of reality that a great meal with wine should not have to cost un braccio e una gamba. And most importantly, it nourished the kind of vacation I really needed, where nothing I saw or heard or tasted reminded me in the least of my everyday life.